Take one area hit by war and drought, mix in a local government distrustful of outside influences, add a pinch of a rich country trying to prevent aid money being used for terrorism and you have a recipe for disaster. 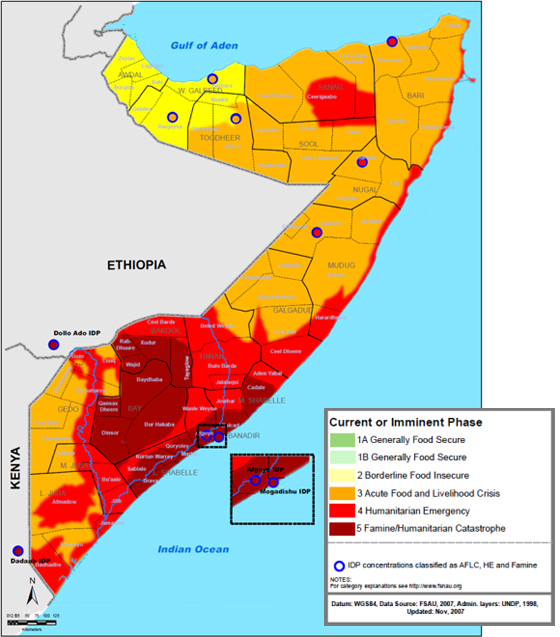 Elsevier’s new Global Food Security journal devotes its first issue to exploring the reasons behind the Somalia famine of 2011-12 and why it was not prevented. While drought and crop-damaging conditions will always be with us, famine deaths could be prevented through an early-warning system that recognizes potential famines quickly and coordinates aid. Somalia had such an early warning system that should have done just that. The Integrated Food Security Phase Classification, developed in 2004, should have alerted authorities of an impending famine beginning in August 2010. The first signs of a problem came in late 2010 when the rainfall in southern Somalia was the lowest ever recorded. As a consequence, yields of maize and sorghum in 2011 dropped to less than a third the 5-year average. Livestock died due to a lack of food and water. In addition, the global price of food rose steeply, making it difficult for poor farmers to buy food. The first issue of Global Food Security, which includes review articles about the Somalia famine of 2011, is freely available on ScienceDirect. Despite the early warnings, the United Nations did not formally declare a famine in southern Somalia until June 20, 2011. Once a famine was declared, the non-governmental organizations, such as theRed CrossandUNICEF, would be able to move in quickly and help those needing support. Unfortunately, this is where the history of the region and its politics – local, regional and global – made the situation worse. Southern Somalia was in the grip of civil unrest. Al-Shabaab, a strict Islamist organization that controlled part of southern Somalia, reduced the amount of cheap food imports though Western aid to protect Somali farmers and restrict Western influence. The US had designated Al-Shabaab as a terrorist organization in 2008, and in 2009, it introduced a policy of reducing non-humanitarian aid to areas under the control of terrorist organizations. This had the effect of reducing US funding for Somalia by 88 per cent. Although this policy did not apply to humanitarian aid, many agencies assumed that the US would not be prepared to fund aid to Southern Somalia. As a result, conditions deteriorated from crisis to emergency to famine because aid agencies had no reserves of food and money and no personnel in place to help hardest hit areas. Once the famine was announced, the media took up the story, and funds were made available to provide aid. However, the aid that was sent to Somalia was siphoned off by militias on all sides who demanded payments, or “taxes,” to allow food convoys to pass. People moved from the country to Moghadishu, where refugee camps were set up by local militias. These militias were eager to set up camps so that they could control the food aid entering the country. The Somalia famine can teach us many lessons, said guest editor Dr. Daniel Maxwell, professor and Research Director for Food Security and Complex Emergencies at the Feinstein International Center at Tufts University in Massachusetts. “With many of the major humanitarian players absent from the affected area, and prohibited from returning by the local authorities, novel responses had to be scaled up quickly under conditions of minimal and dangerous access,” he explained. Read the article he Dr. Maxwell co-authored with Dr. Merry Fitzpatrick for Global Food Security: "The 2011 Somalia famine: Context, causes, and complications." Global Food Security arose from concerns of scientists and policymakers about keeping up with expanding data on the challenge of meeting human food and nutritional needs. Famine is the most severe among the issues authorities are tracking that also include poor harvests in the US this year due to drought, an expanding world population, and increased demand for food and other resources by developing nations such as China, Brazil and India. [note color="#f1f9fc" position="left" margin=10] [/note]Related problems include the debate over whether land should be used to grow biofuels or food, how to fairly share water supplies, the safety of genetically modified foods, and the growth of indoor farming. Gilles Jonker, Executive Publisher ofGlobal Food Security,said his conversations with scientists and policymakers around the world showed the need for one journal that could highlight the most important information.Global Food Securitywill contain review articles that summarize current research on this topic from various disciplines. “With this journal,” he said, “Elsevier is providing an important resource for all those working to maintain and improve nutrition levels.” This first issue of Global Food Security was published in November. Three issues are planned each year containing reviews on four areas of food security: nutrition, agronomy, policy and economics, and climate and the environment. 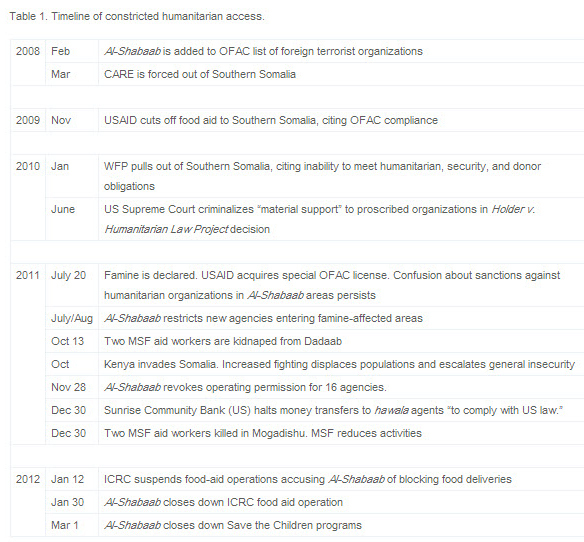 Why did Al-Shabaab reduce food aid? The idea was to decrease the rural population’s dependence on Western help, specifically imported food, which drove down the price of local produce and local farmer income. With less cheap food being imported, the price for locally grown crops such as maize and sorghum increased, benefitting the local farmers. Unfortunately, when harvests failed due to the lack of rainfall, there were no reserves to fall back on. Somalia was declared free of famine in February, when aid and a good harvest meant that more food was available. Still, 28 percent of Somalia’s population is in the “crisis” or “emergency” states, though the situation is rapidly improving, according to the latest report of the UN-backed Food Security and Nutrition Analysis Unit – Somalia, issued in October. A good harvest in January compensated for the somewhat a poorer harvest in August and September caused by low rainfall and pest outbreaks among other things. Higher food prices and wages have provided more income to agricultural areas. The south remains the area worst affected by lack of rainfall, while cereal production has recovered in the north. The political situation remains unstable, with various militias fighting for control. Joanna Aldred is the content development manager for Physical Sciences II at Elsevier and is responsible for the day-to-day operations of Global Food Security. She has been working closely with the editors, publisher and journal manager. She is based in Amsterdam. It is really sad to notice like many problems could be avoided but not many people like you care too much about.